The above animation of the cell cycle would usually be illustrated by some such as the cell states array (above, middle) or the phase diagram (above, right), each in their way marking the general sub-periods that have been defined for the normal process of cellular working and duplication. This can also be represented by a loop within a loop whereby the interphase state includes the synthetic phase of DNA duplication. Cellular self-replication, which in essence relies on the population dynamics of mitochondria (whose reproduction runs at something like 10x the cellular rate) as these also have function as oxygen attractors, or sinks, extends then from 'birth' of the independent cell marking the end of the division process (mitosis), through re-establishment of nuclear working (G1) to enable DNA synthesis (S), until the onset of the next division process (at the end of G2). The cytoplasmic 'duplication' that is required to produce two cells of similar state to the progenitor thus introduces a third loop of coupled systems. It is just such threefold systems that can produce chaotic dynamics. 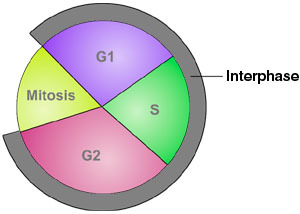 The toroidal model is chosen because of the vesicular traffic between the exterior of the cell, i.e., the cell environment, and the input and output flows to the cytoplasm. Modelling likewise for the nucleus and nucleolus respectively embeds each within the other, but each then also has direct connection to their external environment. Each also models as a caustic boundary because of that input mode. The relative timing of events here is very variable between cell types, if not signature for them, and the duration of each of the cell phases is also highly variable. Whilst this tells us much about the extraordinary tolerance or robustness of the system, it does not tell us about the real dynamics for the working cell, i.e., in situ. Of course many of the cells of the body do not replicate at all, i.e., do not cycle, but are thrown off by their mother cells to a singular fate, e.g., epidermal cells or erythrocytes. It is as yet unrecognised, but here felt to be significant, that the stem cell populations that throw off these daughter cells are in most part attached to the basement membrane, which is, as an amplification of the cell membrane model, the Faraday cage of the multicellular organism. Other stem cell populations within the organism are themselves contained within further membrane boundaries, e.g., testes, ovaries, spleen. 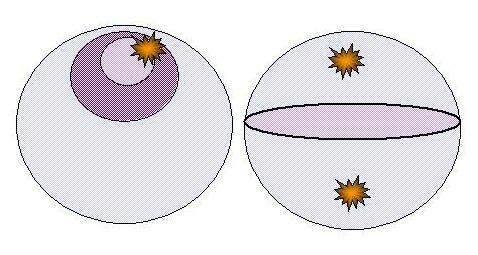 As elsewhere on this site, simple illustration is felt to be more readily informative for the non-specialist, so illustration is given below to the two cellular states which, in the model to be developed here, are taken as the extreme points of the cycle in terms of cellular geometry and dynamics, these being the 'working' and 'metaphase' states of the cell. The above is intended as diagrammatic illustration of the working state which is here presented so as to make clear the functional relations of five 'half' chromosomes that are highly condensed, highly iterated DNA sequences coding for rRNAs carried on chromosomes 13, 14, 15, 21 and 22. We will be addressing their functionality more closely in the next section. When not coding for rRNA, i.e., involved in the process of transcription, these structural arrays can then also be seen as presenting a quasi-periodic crystalline array which, taken in section, could also act as a photonic - or indeed ionic - crystal. 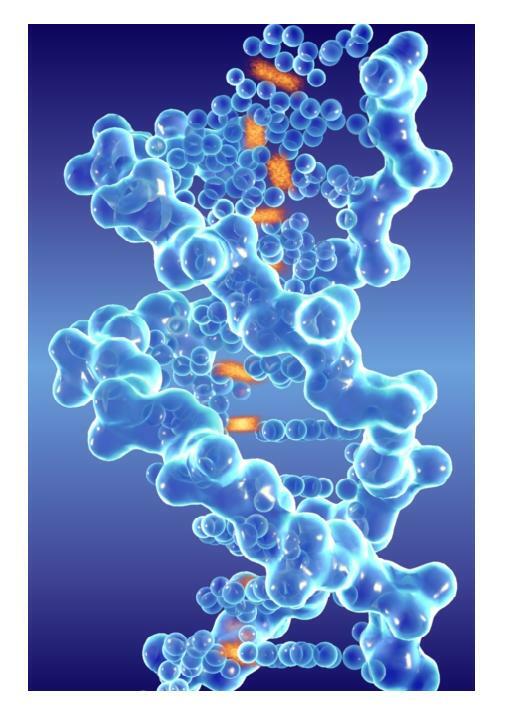 Most noticeable is that the form proposed to be the active DNA state, i.e., the B DNA form, is that point in the pitch twisting between states when the axis of the DNA core is at 90o to the plane of the base pair bonds across the helix. Given that the bases are resonant structures, i.e., cyclic, and have strong pi-orbitals, it has to be suspected that there is some possible function here for the plane of the base-pairs to act as an electromagnetic mirror or 'state splitter'. 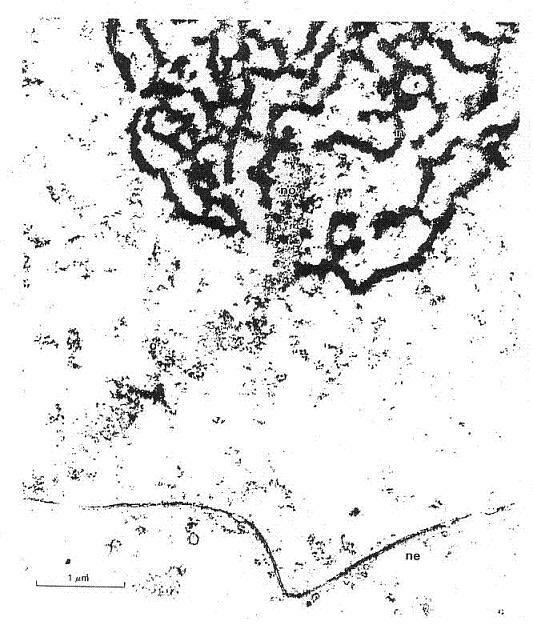 It is notable also that in the working state the general disposition of the nucleolus generating arms is to be strung across from the nucelolar core to the periphery of the nucleus itself and the picture given below, albeit artifact or otherwise, neatly illustrates the sort of thinking that the physicists - such as Frohlich and Popp - have in mind when addressing issues around the propagation of waves, 'solitons' or 'polarons' along the length of the DNA. Here we seem to have captured just such a wave in process. This general arrangement indicates that we need to look at standing wave phenomena given that these particular half chromosomes or chromosome arms extend between the geometrically invariant arrangements that give rise to the nucleolus to the relatively 'free' chromosome end attached to the nuclear membrane. A wave seems to travel along the arm from the nucleolus (top) to the nuclear membrane (bottom)? The B DNA form is also the configuration that acts to minimise the amplitude of the helical proton stack in core of the DNA formed by the 2 or 3 hydrogen base-pair bonds. 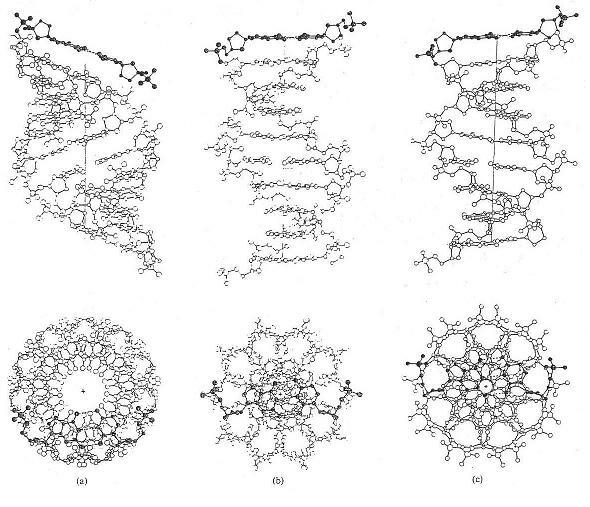 These can effectively be modelled as a hydrogen crystal ribbon threading through the core of the DNA (see illustration below). There are naturally going to be perversities in the operation of biological systems against the systems built by the physicists, as here in the operation of what would seem to be a photonic crystal array. The physicists would seek to perfect the crystal structure and, therefore, the photon/quantum/information transmission, minimising incidental losses as 'heat' to the embedding system and effectively achieving the construction of a superconducting system. Living systems in fact depend on that precisely not being the case. Photons as quanta or information might be something with which science can play, but living systems have more absolute need of the photons they capture and use them to their own ends against the drive to equilibrium guaranteed by the second law. Moving to the other of the significant cellular states for the model, illustrated below is the metaphase state, a minimum state for biological working, but suspected to be a maximum state for the physics that is driving the system. That is to say, the biological working is just basal metabolism and the tail-end working out in the cell cytoplasm of the last generation of mRNA transcripts, edits and translates. The chromosomes, at this stage, are maximally wound self-enclosed systems and dance or 'jitter' on the metaphase plate which structure gives a common base for the chromosomes to self-assort. At this point the DNA is maximally wound and confined to the metaphase plate, which is a merciful reduction of the dimensional complexity for modelling purposes. 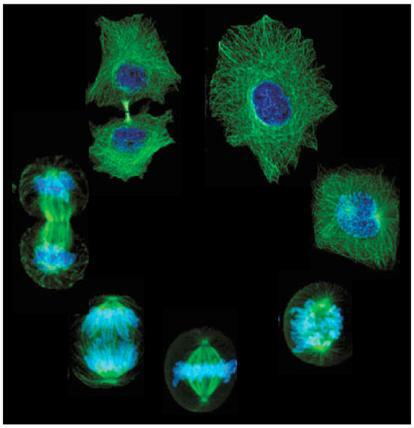 It is also then disposed, wherein the duplicated chromosome sets form the metaphase plate, as the perpendicular target of the microtubule bundles centred at the old site of the nucleus and now occupied by the centrosome. Whilst for the classical biologists the working state microtubule function and description generally have to do with transport of various molecules, for theorists such as Hameroff and Penrose, who have raised the possibility of superconduction within these tubules, the spindle or metaphase state could offer something far more significant. If we are using nanotubes as analogue for the possible functionalities of microtubules - and, indeed, it has been shown that stacked microtubules, in the form of buckeytubes, allow the transport of water molecules whilst preventing the throughflow of ionic, water-bound, atoms. 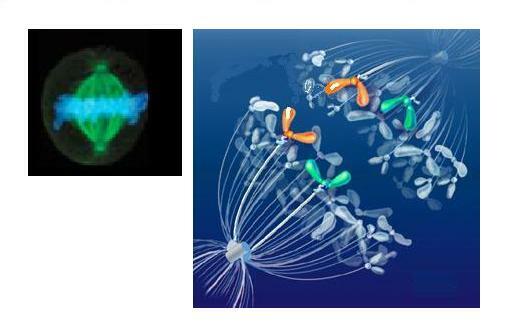 In this much is raised the idea that molecular organisation can underpin an atomic scale disequilibrium and here the spindle microtubules might be seen as feeding pure water to the chromosome or extending the tubule entrained ion cloud to the exterior of the metaphase chromosomes. One last consideration that perhaps needs be mentioned here is that in the metaphase arrangements, where the chromosome set comes to form the metaphase plate, there is maybe indication of some sort of gyroscopic functionality being realised in this formation, the 90 degrees between the centrosomal poles and the relatively huge and now spread physical mass of the genome then acting as the gyroscopic plane. This might make more sense later when we can pull together the more physical picture of ceullar dynamics in this respect. Yet another interpretation of the nuclear dynamics between the working and mataphase states, in terms of the genome mass dynamics, would be that of a bouncing ball, moving between the states of spheroidal bundle to flattened disc ...? As we will see, this at first seemingly fanciful model, in fact finds some resonance with the atomic dynamics of the working state and we need now to move to address nuclear and genomic dynamics and reinterpret the data of biology in the light of our needed physical understanding.